“The ocean? It’s over the ocean to Scranton, Pennsylvania?” This may very well be the funniest comedy ever made (okay, maybe not, let’s say the funniest comedy of 1979). Renegade CIA agent “Vince Ricardo” (Peter Falk) involves future in-law, the uptight dentist “Sheldon ‘Shelly’ Kornpett” (Alan Arkin), in a plot to expose a counterfeit scheme masterminded by a Latin American syndicate. Favorite moment: The “serpentine” chase scene on the runway. Second favorite moment: After the in-laws smuggle $10 million from the transaction, fellow CIA agent Barry Lutz (Ed Begley Jr.) shows up at the wedding and presents the newlyweds with a $50 savings bond, a gift “from the boys at the agency.” Directed by Arthur Hiller and written by Andrew Bergman, The In-Laws also stars Richard Libertini as the insane “General Garcia” (who has a hand puppet named “Senor Pepe”) and James Hong as “Bing Wong,” as well as Nancy Dussault, Arlene Golonka, Penny Peyser and Michael Lembeck. 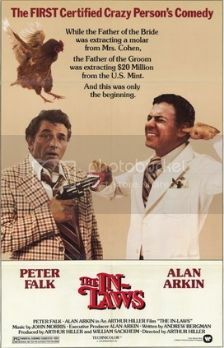 The In-Laws was originally envisioned as a sequel to Freebie and the Bean (1974), which also starred Arkin. The film was remade (rather unsuccessfully and pointlessly) in 2003 with Michael Douglas and Albert Brooks. Useless Trivia: Marlon Brando reportedly told Arkin that he had viewed The In-Laws at least 20 times and it was one of the main reasons he agreed to star in The Freshman (1990), which was written and directed by Bergman.